March 11, 1999, was a date which would see a profound change in the Basilica, and in the minds of thousands of Western New Yorkers. For it was on that day that Father Nelson Baker "came home." In July of 1998, then-pastor Msgr. Robert Wurtz announced that the earthly remains of Father Baker would be transferred from nearby Holy Cross Cemetery into the Basilica. The move, which was recommended by the Congregation for the Causes of Saints in Rome, would help raise awareness of the humble priest, his mission and his legacy. On that sunny March morning, Father Baker's casket was carried into the Basilica and placed in a tomb within the Grotto Shrine to Our Lady of Lourdes. A truly unique area, the Grotto is hewn out of lava rock from Mount Vesuvius in Italy. 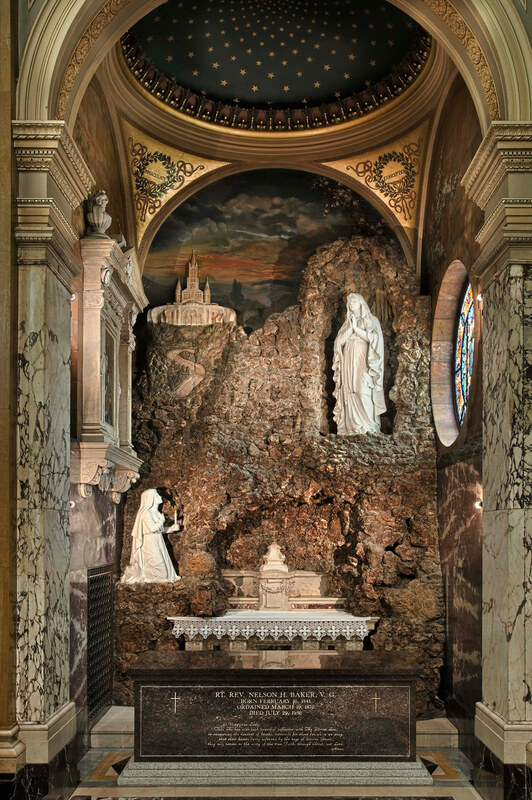 At the time of its construction, Father Baker insisted on finding a material that was untouched by human hands to pay tribute to the vision of Our Blessed Lady to St. Bernadette in Lourdes, France.